Do you like to add chili peppers or powder to your food? If yes, then you might be aware of capsaicin, the chemical responsible for hot peppers’ spicy kicks. The more capsaicin it contains, the hotter it is. With the exception of bell peppers, capsaicin is generally synonymous with peppers and is found in abundance in cayenne peppers. Capsaicin is found in every part of the peppers except for the seeds, although the highest concentration is found in the inner wall where the seeds attach. Being a molecular compound, capsaicin has no dietary content, such as calories or additional nutrients. But it has numerous health benefits. 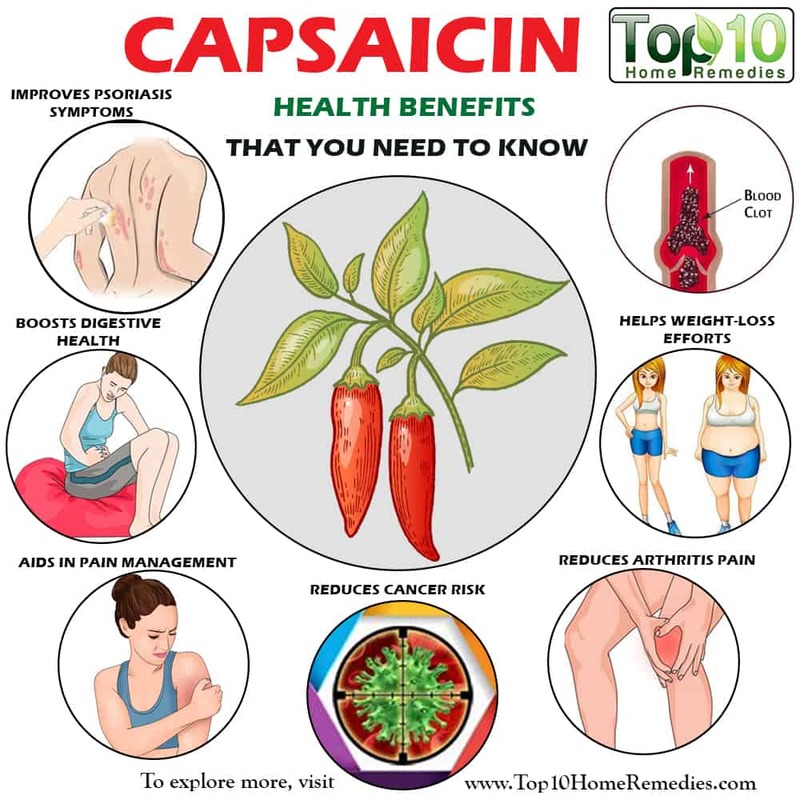 In fact, a massive and ever-growing body of research supports the health benefits of capsaicin. Many people use supplements and creams containing capsaicin for its analgesic effects related to muscles, nerves and joint pain. It also has heart-protective and anti-tumor properties. But many good things come with side effects, and capsaicin is not an exception in this regard. 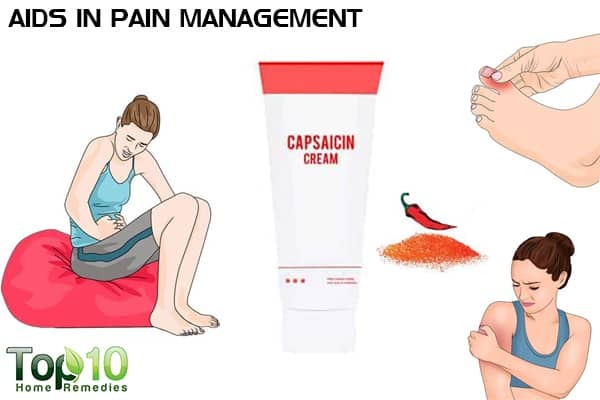 Both capsaicin creams and patches can irritate your skin and cause problems like redness and swelling, soreness, dryness, burning and itching. The side effects can get worse in hot and humid weather. It can also make your skin more sensitive to the sun and heat. Hence, it is always recommended to do a patch test before using over-the-counter capsaicin products on your skin. But, you must not forget that the benefits of capsaicin outnumber the side effects. Capsaicin is also available in supplement form, which works well for treating certain ailments. Caution: Capsaicin may interact with certain medications and herbal supplements. So, consult your doctor before taking oral supplements. 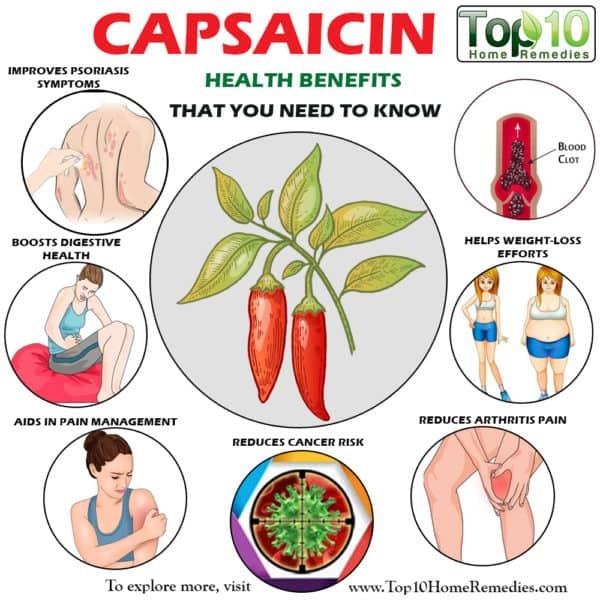 Here are some of the health benefits of capsaicin that you need to know. Whether you have pain in your muscles or joints, capsaicin works as a natural painkiller. It exhibits an anti-inflammatory effect that helps reduce pain and inflammation. It also prevents the activation of the brain’s pain transmitters, which in turn reduces the feeling of pain. A 2011 study published in the British Journal of Anesthesia notes that topical application of capsaicin cream is effective for pain management (1). A 2016 study published in Molecules highlights the analgesic effects of capsaicin and its clinical applicability in treating pain (2). Apply a little bit of over-the-counter cream or lotion containing between 0.025% and 0.075% purified capsaicin on the painful area and massage gently. Do it 2 or 3 times a day until the pain is gone. Another option is to mix ½ teaspoon of ground cayenne pepper and 2 to 3 teaspoons of warm olive or coconut oil. Apply it on the painful area. Let it sit for 10 to 15 minutes, then rinse it off. Repeat once or twice daily until the pain is gone. If you’re trying to lose weight, you should probably consider eating capsaicin-rich foods. 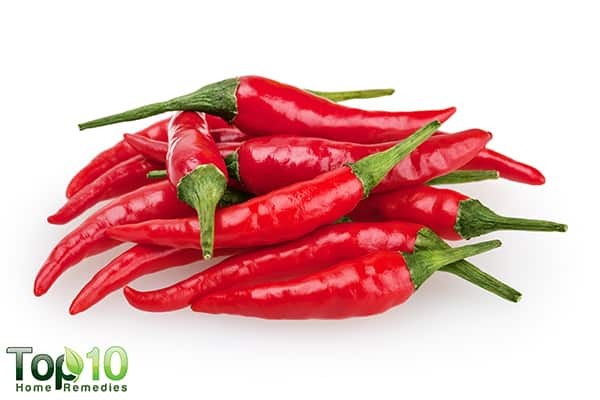 Capsaicin is a thermogenic agent, which means it increases metabolic activity. This, in turn, helps burn calories and fat. Plus, it reduces the production of ghrelin, the hormone responsible for triggering hunger. A 2012 study published in Molecular Biology Reports concludes that eating spicy foods rich in capsaicin may lower body weight, speed up metabolism, help burn fat and suppress appetite in animals (3). 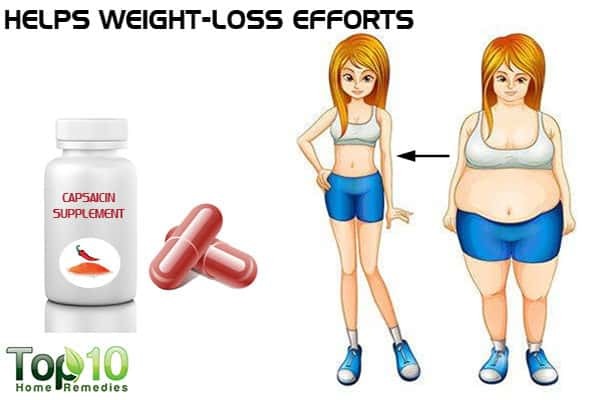 A 2016 study published in the International Journal of Obesity reports that consumption of capsaicinoids and capsinoids may be helpful to facilitate obesity management (4). Interestingly, capsaicin also helps curb your hunger, helping you eat less and feel full for a longer time. Consult your doctor about using capsaicin supplements to help control your appetite and increase fat metabolism. Also, you can use cayenne pepper in your cooking. To deal with any kind of arthritic pain, capsaicin is very effective. Its analgesic and anti-inflammatory properties help get rid of the pain and reduce the swelling. A 1991 study published in Clinical Therapeutics found capsaicin may be an effective remedy for arthritis. 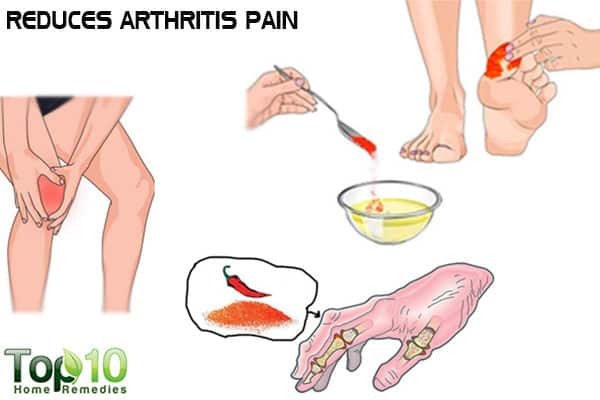 Rheumatoid arthritis and osteoarthritis patients who received capsaicin cream for painful knees experienced mean reductions in pain of 57 percent and 33 percent, respectively, after four weeks (5). Add ½ teaspoon of cayenne pepper powder to 1 tablespoon of lukewarm coconut oil. Mix thoroughly, then apply it on the painful arthritic area. Allow it to sit for 20 minutes. Rinse it off with lukewarm water. Do this 2 or 3 times a day. Alternatively, you can massage the arthritic area with capsaicin cream, 2 or 3 times a day. 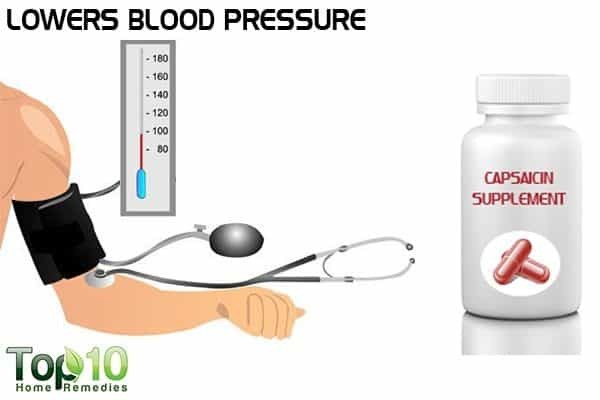 High blood pressure is something that you should not ignore, as it puts stress on your heart and your arteries, potentially leading to numerous diseases from heart to kidney problems. To keep your blood pressure under control, the capsaicin in cayenne peppers is very effective. According to a 2010 study published in Cell Metabolism, researchers report that capsaicin leads blood vessels to relax, which in turn reduces the blood pressure. The study was done on hypertensive rats (6). A 2015 study published in Open Heart reports that capsaicin helped relax blood vessels in pigs, leading to lower blood pressure (7). To keep your blood pressure under control, you can opt to take capsaicin supplements, but consult your doctor first. You can also use cayenne pepper in your cooking. Psoriasis, an autoimmune disease, causes patches of red, itchy and scaly skin. 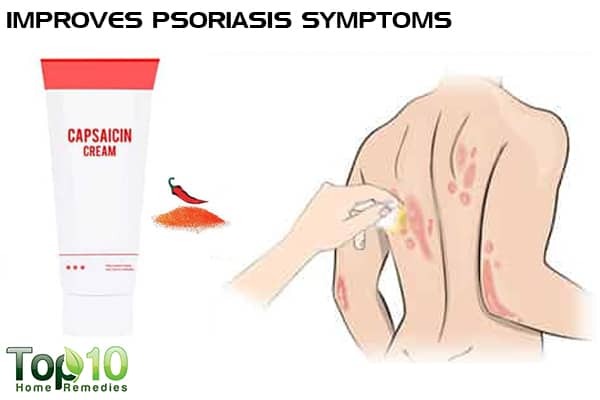 While there is no cure for this disease, capsaicin creams can provide relief from itching and improve the appearance of psoriatic patches. A 1993 study published in the Journal of the American Academy of Dermatology reports that topically applied capsaicin effectively treats pruritic psoriasis (8). Later in a 2010 study published in the Journal der Deutschen Dermatologischen Gesellschaft, German researchers reported that capsaicin may help reduce inflammation, pain, redness and scaling that are commonly seen in psoriasis (9). Apply a capsaicin cream on the areas where you have psoriasis, 2 or 3 times a day. Capsaicin is a powerful tool against cancer. It has a profound antiproliferative effect on different types of cancer, including prostate and breast cancer. Taking capsaicin orally can significantly stop the spread of cancer cells as well as cause apoptosis (cell death). In a 2010 study published in Future Oncology, researchers found that capsaicin potently suppresses the growth of human prostate carcinoma cells in vitro and in vivo. The antiproliferative activity of capsaicin correlates with oxidative stress induction and apoptosis (10). According to a 2016 study by researchers at Ruhr-Universitaet-Bochum, capsaicin inhibits the growth of breast cancer cells (11). 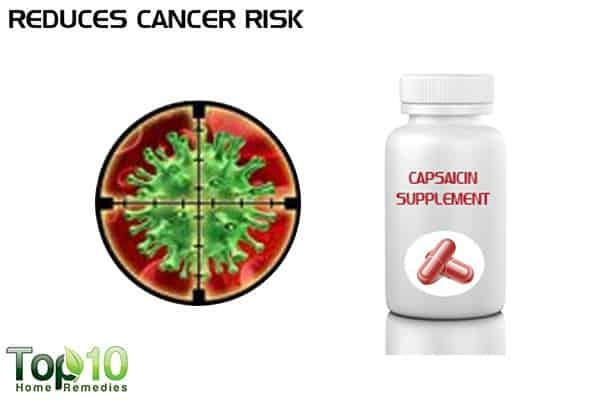 To keep yourself safe from deadly cancer, consider taking capsaicin supplements regularly. Consult your doctor first. Also include this spice in your cooking. Capsaicin is also good for your digestive health. 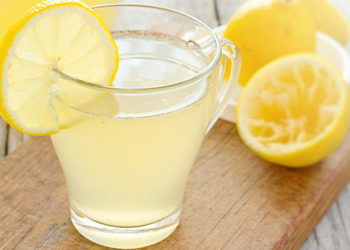 It helps regulate the digestive system and eliminate waste products and toxins more effectively. It can also boost the stomach’s defense against infections, increase digestive fluid production and help deliver enzymes to the stomach. All these elements are important for a healthy digestive system. In a 2014 study published in Progress in Drug Research, researchers concluded that capsaicin represented a new orally applicable gastroprotective agent in healthy human subjects and in patients with different chemical and Helicobacter pylori-induced mucosal damage and many other diseases requiring treatment with nonsteroidal anti-inflammatory drugs (NSAIDs) (12). A 2016 study published in the Journal of Complementary and Integrative Medicine summarizes the phytochemistry and various gastrointestinal benefits of various active constituents of cayenne pepper like capsaicin (13). 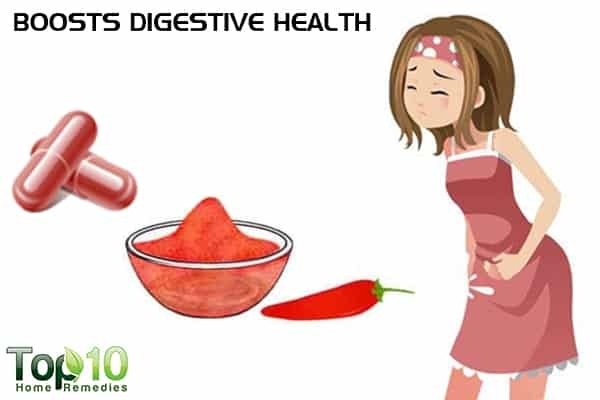 Capsaicin may also reduce your risk of stomach ulcers by inhibiting acid secretion, as well as stimulating alkali, mucus production and gastric blood flow. A study published in Critical Reviews in Food Science & Nutrition in 2006 highlights that capsaicin can help prevent and heal ulcers (14). To help fight stomach infections, simply mix a pinch of cayenne pepper powder in a glass of water and drink it once a day. You can continue for a few days. You can also take capsaicin in supplement form but only after consulting your doctor. Capsaicin has a powerful blood-thinning effect and also increases circulation throughout the body. 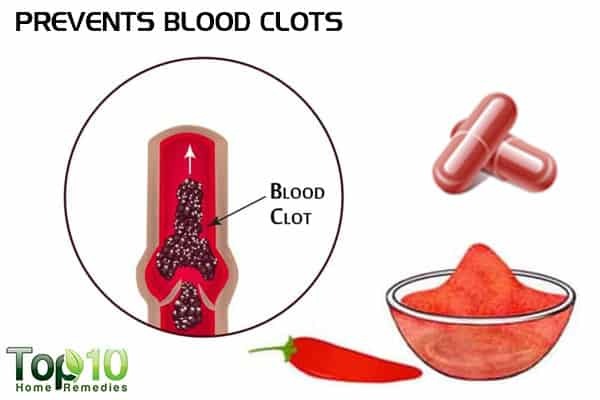 It can help clear away artery-narrowing lipid deposits, and might help dilate arteries and blood vessels to clear away clots. It also helps lower the concentration of fibrin, an insoluble protein that plays a key role in clot formation. Also, you can sprinkle ground cayenne pepper on breakfast dishes, salads and other dishes. You can opt to take capsaicin supplements, but consult your doctor first. Test topical ointments and creams containing capsaicin on a small area of healthy skin to check for irritation before using it. Do not use ointments and creams containing capsaicin with a heating pad or apply it immediately after a hot shower. Do not put ointments and creams containing capsaicin on wounds or irritated skin. Wash your hands with soap and water after applying the ointment or cream to avoid getting it in your eyes or on other sensitive areas of the body. If you prefer taking cayenne pepper orally to reap the benefits of capsaicin, you may neutralize the heat so that your mouth stops burning by drinking milk. Oral capsaicin supplements or products may cause digestive problems like gas, bloating and diarrhea. Be sure to eat a fiber-rich diet to curb these effects. Topical capsaicin for pain management: therapeutic potential and mechanisms of action of the new high-concentration capsaicin 8% patch. British Journal of Anesthesia. https://www.ncbi.nlm.nih.gov/pmc/articles/PMC3169333. Published October 2011. Capsaicin: Current Understanding of Its Mechanisms and Therapy of Pain and Other Pre-Clinical and Clinical Uses. Molecules. www.mdpi.com/1420-3049/21/7/844/pdf. Expression of TRPV1 in rabbits and consuming hot pepper affects its body weight. Molecular Biology Reports. https://www.ncbi.nlm.nih.gov/pubmed/22327653. Published July 2012. Capsaicinoids: a spicy solution to the management of obesity? International Journal of Obesity. https://www.ncbi.nlm.nih.gov/pubmed/26686003. Published August 2016. Treatment of arthritis with topical capsaicin: a double-blind trial. Clinical Therapeutics. https://www.ncbi.nlm.nih.gov/pubmed/1954640. Chili peppers may come with blood pressure benefits. ScienceDaily. https://www.sciencedaily.com/releases/2010/08/100803132734.htm. Published August 04, 2010. Capsaicin may have important potential for promoting vascular and metabolic health. Open Heart. https://openheart.bmj.com/content/2/1/e000262. Published June 01, 2015. A double-blind evaluation of topical capsaicin in pruritic psoriasis. Journal of the American Academy of Dermatology. https://www.ncbi.nlm.nih.gov/pubmed/7688774. Published September 1993. Which plant for which skin disease? Part 1: Atopic dermatitis, psoriasis, acne, condyloma and herpes simplex. Freshwater Biology. https://onlinelibrary.wiley.com/doi/full/10.1111/j.1610-0387.2010.07496.x. Published August 05, 2010. Effect of capsaicin on prostate cancer cells. Future Oncology. https://www.ncbi.nlm.nih.gov/pubmed/21062154. Published October 2010. Spicy molecule inhibits growth of breast cancer cells. ScienceDaily. https://www.sciencedaily.com/releases/2016/12/161220094449.htm. Published December 20, 2016. Capsaicin as new orally applicable gastroprotective and therapeutic drug alone or in combination with nonsteroidal anti-inflammatory drugs in healthy human subjects and in patients. Progress in Drug Research. https://www.ncbi.nlm.nih.gov/pubmed/24941671. Capsaicin and gastric ulcers. Critical Reviews in Food Science & Nutrition. https://www.ncbi.nlm.nih.gov/pubmed/16621751. You forgot something maybe you didn’t know. Years ago I attended an natural living group meeting. A farmer related a story he had experienced with an accident where his thumb was almost completely severed. He poured powdered capsaicin on it. It hurt like the dickens but the bleeding stopped. The EMS techs told him that the powder probably saved his life. very good infor. and was very helpful with details of how to apply the item and the side effects with who and how it should be used by users. Great job of putting things together for the general public.